Released in April of 2010, Apple’s inaugural tablet, the iPad 1st Generation, made quite an impression on consumers seeking more capabilities than those offered by cell phones, but with just as much portability. The launch of the iPad brought gaming, video, and web capabilities to a brand new level and continued Apple’s reputation for technological innovation. Users already familiar with the Apple iPhone will see many similarities with the iPad 1st Generation. The design is minimal, including the familiar Apple Home button, a volume rocker, and a power/sleep control. Unfortunately, also similar to the iPhone, the screen is easily smudged with fingerprints. New with the iPad is a screen rotation lock switch, meaning that unlike the iPhone users can opt for the screen to lock in either landscape or portrait mode so that minimal turning will not shift the contents on the screen. There are also pop-overs or modals which allow users to hover over an item and see a pop-up window that contains more information. Split screen options also divide the content and allow users to view multiple information at once. The larger screen size of the iPad when compared to the iPhone means that gamers have a new way to play games on the go. Consumers are also excited about the video capabilities of the iPad, especially for features such as Netflix and the ABC video player. One of the favorite aspects of the iPad was the ability to use apps for entertainment, but those apps that weren’t native to the iPad did not always take advantage of the larger screen size. The iPad 1st Generation was the answer to many consumer requests for more portability, but there are a few misses in terms of hardware. Unfortunately, there is no webcam on the iPad 1stGeneration, meaning that consumers can’t access the popular Skype app for video calling. The headphone jack is also placed inconveniently at the top of the device, meaning that the cord can drag across the screen during use. There is no USB port or SD card reader, another miss on the hardware list. 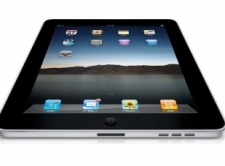 The iPad 1st Generation is powered by a 1GHz A4 SOC processor, very similar to the iPhone. This modified operating system includes a few new features such as drop-down menus that allow for more viewing options. The device comes with many built-in apps, such as a web browser, media player, calendar, digital compass, and iBooks. Gaining popularity as an eBook reader, the iPad 1st Gen has an LED backlit display to make reading on the device easier. The iPad 1st Generation harnessed a lot of excitement in the tablet market, giving gamers motion sensors and multi-touch features to make their experiences even more realistic. As with any launch of a new piece of technology there were complaints, such as the lack of a unified email inbox and support for tethered connection capabilities, but overall the original iPad won a lot of fans. The device helped bridge the gap between smartphones and laptops by offering functionality combined with portability. The iPad 1st Generation is thought of as a dinosaur by many due to the shocking amount of advancements contained in the Apple tablet computers that followed. Therefore, most online casinos are not specifically designing their software with that device in mind any longer. However there are some great options still out there for those who refuse to upgrade their tablet computers to newer models, so here are the best online casinos for the iPad 1. The best online casino for the iPad 1st Generation is definitely the Bovada Casino as they accept players from all over the United States, and offer great bonuses and promotions. Their software still looks great on the 1st Gen, (even though it doesn’t have Retina display), and the games selection of the Bovada mobile casino is huge. Our choice for the best online casino for iPad 1 users in the United Kingdom may surprise you – it actually surprised us too. However after testing over a hundred mobile casinos, the Ladbrokes Casino was the one who impressed us the most on an original iPad. Although they are known primarily for their land based betting shops throughout the U.K., their mobile casino looks fantastic, plays beautifully, and offers a wide range of games. They are definitely worth a visit. Even though their name and reputation were built on their sportsbook, the SportsInteraction Casino is an excellent product, and is by far the best online casino for those on an iPad 1 living north of the 49th parallel. SportsInteraction offers hundreds of mobile casino games with fantastic graphics, and we have never experienced any lags or frozen games with them during our hundreds of hours of testing.